How To Boost Customer Engagement With Live Chat? This quote by Bob Hooey aptly denotes the importance of delighting your customers from the word go! Buyers and the buying process have witnessed a radical shift in the modern era, thanks to the endless ocean of possibilities provided by the mighty internet! A variety of marketing and b2b sales automation tools are widely adopted by modern marketers and salespeople to achieve a unified business objective of generating qualified leads and ROI for the business. The first step in the modern sales process starts with a prospect visiting your website looking for some help a.k.a useful information. Smart marketers make effective use of this opportunity by deploying a live chat module to assist the website visitors. Instant help can be provided by means of answering queries or guiding them to the right page. It will also enable quick resolution of complaints which helps to build the foundation for trust and long term relationships. The marketing and sales team can identify potential leads based on conversation and interact with them in a manner that engages them further into the sales funnel, thus, converting them into paying customers. This not only drives revenues but also boosts sales and marketing alignment. Forrester research has shown that live chat customer service is 17-30% cheaper than a phone call. It is simple and much very effective in engaging your website visitors through interactions and quick resolution of queries. 1. Engage Website Visitors- by answering queries and offering useful information and support in the form of ebooks, guides or simple call-back from the concerned team member. 2. Generate Qualified Leads- based on discussions, identify the relevant visitors and guide them deeper into the buying funnel. Marketing and sales teams can identify prospects who have a higher likelihood of conversion and take necessary action. 3. Increase Sales and ROI- by generating qualified leads who have higher chances of conversion into paying customers. This generates revenues and ROI for the business in the long run. 4. Better Understanding of Customer Queries- due to the instant conversation with website visitors,enabling trust building. Real time conversations enable you to get a better clarity of your prospects’ pain points and areas of interest, enabling you to devise a better strategy to convert and retain them. 5. Quick Problem Resolutions- by having a better clarity of the customer requisites and understanding of customers’ problems.This will result in enhanced trust in you as a customer friendly business. 6. Improved Customer Loyalty- by offering immediate resolution to queries. You will not only score brownie points for being effective in query resolution but also gain traction in the form of client referrals. 7. Live Chat Reporting and Analytics - gives you a valuable insight into your chat support agents as well. Couple visitor data with access to chat histories, agent performance reports, wait time reports, and more, and you are set to monitor agent performance, and adjust staffing and training as needed. Don't just take our word, here’s what Forrester research report says- In the last five years, the number of U.S. online shoppers who use live chat has increased from 38% to 58% . This means that more and more companies are adopting live chat every year to meet this demand. Onboarding program- Our trained and certified in-house live chat support team ensures you a quick onboarding through a simple sign-up process,thus, enabling live chat feature activation. Creating a knowledge base- We craft a knowledge base to equip your website with customized live chat support solution, adhering to your business requirements and industry type. On- Demand Training and Consulting- Our team of professional chat experts go through a rigorous training through the knowledge base, developed to familiarize them with your product/services, website,developed scripts and your company as a whole. Say Hello To Your Website Visitors- You’re now ready to go live and greet your website visitors though our professionally trained live chat experts, getting you more sales leads than ever before. Prodigitas focuses on offering an unmatched personalized online chat support services with the help of HubSpot to your website visitors. With a dedicated team of professionals, we equip modern SMB & SME marketers with the right technology, strategy, and services to enable business growth. We offer the best in-house chat support with features tailor-made for your requirement and budget. We also provide ongoing optimization and generate qualified leads after careful filtering. 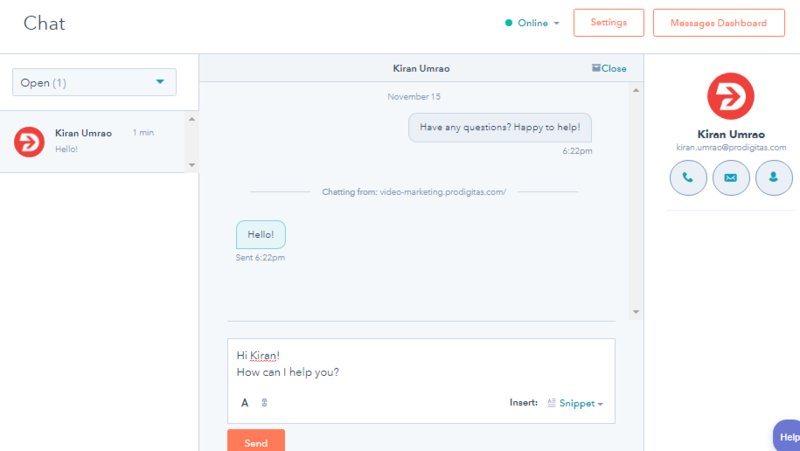 You’ll get instant notifications and chat history details even while you’re away, thus, ensuring complete transparency and maximized business productivity.